Our company provides fabrication services using only the best materials available on the market. The shade fabric and PVC vinyl products. 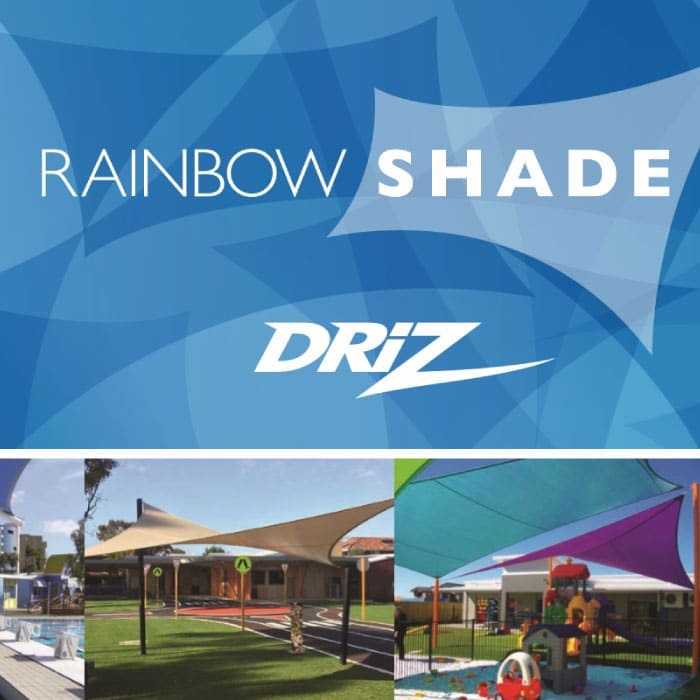 Each product carries a UV Degradation Warranty of 10 Years Except for Rainbow Shade DriZ Waterproof material which carries a 5-year warranty. Please ask for us for the details of the individual brand manufacturers for further information about the warranties provided. 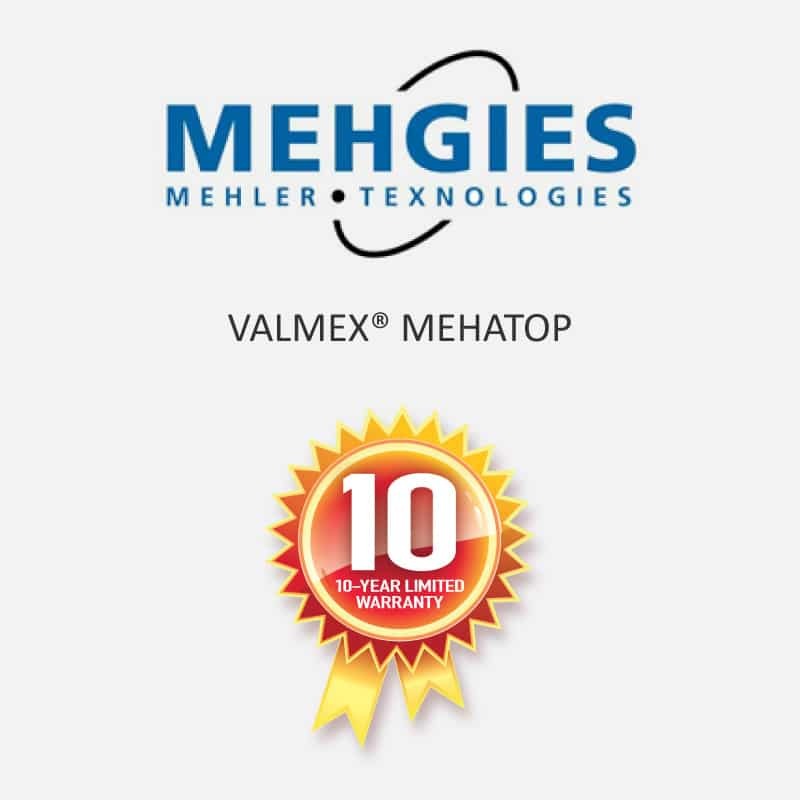 Our stitching degradation warranty is 10 years. Our PTFE Sewing Thread will not be damaged by exposure to weather, sunlight or moisture. We warrant the 3000D PTFE Sewing Thread for 10 years after purchase. The warranty covers applications for the Marine industry (e.g. seat trimming, boat awnings) although this warranty does not cover the use in boat sails. The warranty also covers the use in weather protection (e.g. 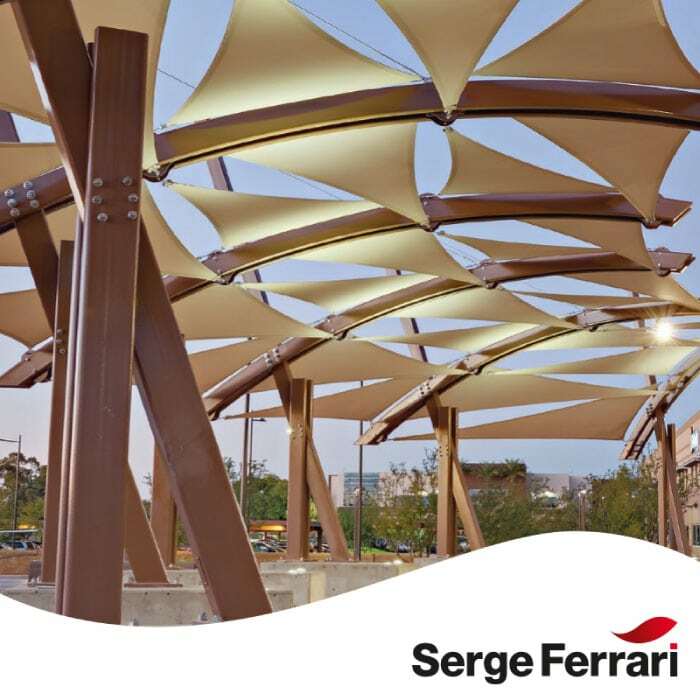 Shade sails and awning, geotextiles). The warranty also covers use in some medical applications. This warranty does not cover defects arising from poor or improper use, abrasion, fire, cuts and other misuse. For a comprehensive list of exclusions refer to our terms and conditions in section 5. We will replace all the sewing thread that fails to meet this warranty. The warranty does not cover any consequential losses that result from any defects such as installation costs. 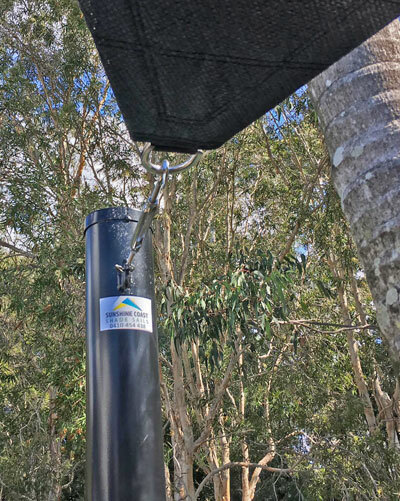 Our installation warranty is 12 months for installation of posts, fixing points including tile and tin roof mounts, sail track fascia works, eye plates, wall plates and other fixing points as required for the installation and tension of the shade sail. Exclusions apply as listed in section 5. 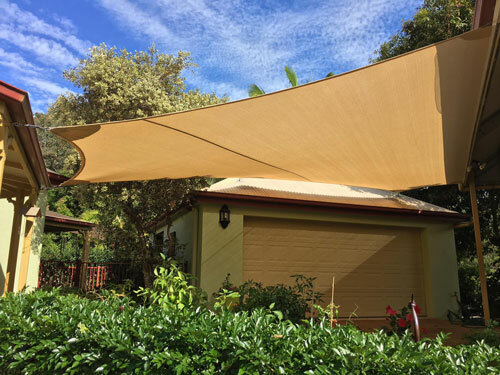 Our shade sail fabrication workmanship warranty is 24 months and covers miss-stitching, poor workmanship and corners breaking away from the fixing points. 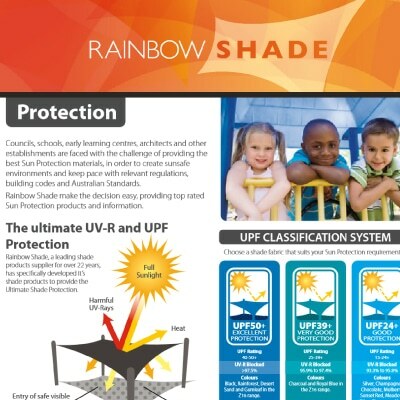 Any discrepancies in the shade fabrication process will be covered in this workmanship warranty. Exclusions are mentioned in section 5. 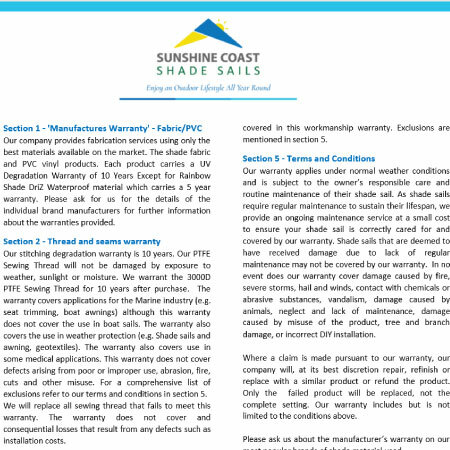 Our warranty applies under normal weather conditions and is subject to the owner’s responsible care and routine maintenance of their shade sail. 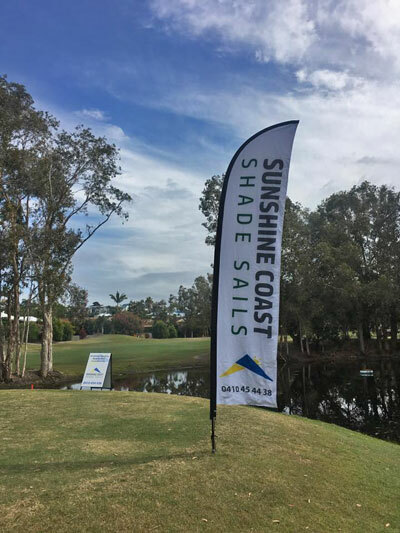 As shade sails require regular maintenance to sustain their lifespan, we provide an ongoing maintenance service at a small cost to ensure your shade sail is correctly cared for and covered by our warranty. Shade sails that are deemed to have received damage due to lack of regular maintenance may not be covered by our warranty. In no event does our warranty cover damage caused by fire, severe storms, hail and winds, contact with chemicals or abrasive substances, vandalism, damage caused by animals, neglect and lack of maintenance, damage caused by misuse of the product, tree and branch damage, or incorrect DIY installation. Where a claim is made pursuant to our warranty, our company will, at its best discretion repair, refinish or replace with a similar product or refund the product. Only the failed product will be replaced, not the complete set. Our warranty includes but is not limited to the conditions above. 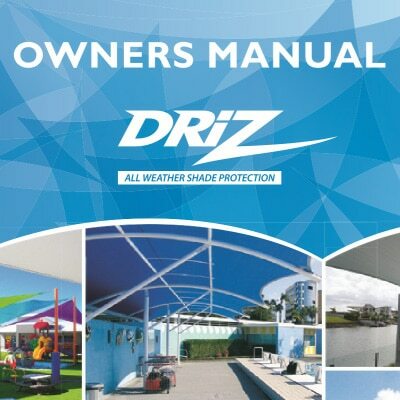 Please see the PDF documents below for an overview of the shade sails we offer, including each shade sail warranty details, solar protection information and technical specifications.